Theme #1: Where and when did Mars have persistently wet environments? Science Background: "Aqueous minerals" are minerals that form in water, either by chemical alteration of pre-existing rock or by precipitation out of solution. Which minerals form depends on temperature, salinity, pH, and composition of the parent rock. Which aqueous minerals are present on Mars therefore provides important clues to understanding past environments. 1) The minerals indicate where liquid water existed long enough to react chemically with rock. The types of aqueous minerals that are present provide information on environmental conditions (e.g., water chemistry, temperature, etc.) and water abundance, thereby providing clues to past Martian environments. Chloride minerals and some sulfate minerals generally indicate very saline water, and sulfates suggest acidic water. Phyllosilicates (clays and clay-like minerals) and carbonates suggest less saline water with a more neutral pH. 2) In some cases, the minerals point to where to look for fossilized evidence of ancient life, if life ever existed on Mars. If past liquid water was not too saline or acidic, if the elements needed for biology were present, and if there were sources of energy to sustain life, then the past watery environment could have been "habitable" - meaning, primitive life could have survived and reproduced in it. Minerals most suggestive of past habitable environments, and which could also fossilize a record of past life, include phyllosilicates, carbonates, and opal. One promising environment for a fossil record is at hot springs: they combine an energy source (heat) with rapidly precipitating minerals that could have fossilized past life. Hot springs are thought to have nurtured and fossilized the earliest life on Earth. They have distinct mineralogies that, if present and large enough, could be detected with CRISM. Lake environments could also have been habitable, and some are favorable for fossil preservation - particularly those that left sediments rich in carbonates or clays. Hundreds of highland craters with deposits that may have formed in lakes were recognized, even prior to CRISM, as promising locations for possible life-sustaining environments. The Pre-CRISM view. The OMEGA spectrometer on Mars Express and the MER rovers both uncovered evidence for aqueous minerals. OMEGA revealed two distinct kinds of aqueous deposits. The first, containing sulfates such as gypsum and kieserite, is found in layered deposits of Hesperian age (Martian middle age, roughly from 3.7 to 3 billion years ago). The second, rich in several different kinds of phyllosilicates, instead occurs rocks of Noachian age (older than about 3.7 billion years). The different ages and mineral chemistries suggest an early water-rich environment in which phyllosilicates formed, followed by a dryer, more saline and acidic environment in which sulfates formed. The MER/Opportunity rover spent years exploring sedimentary rocks formed in the latter environment, full of sulfates, salts, and oxidized iron minerals. Question 1.1: Did Martian rocks ever weather to form soils like those on Earth? What do the soils tell us about past climate? Soil forms from parent rocks through physical disintegration of rocks and by chemical alteration of the rock fragments. Physical processes that form soil include impact fracturing (much more important on Mars than Earth! ), temperature cycling, freeze-thaw cycles of water in cracks, and mass wasting (sliding of loose material down slopes). Chemical processes form new minerals when the rock particles react with water, oxygen, or carbon dioxide. The types of soil minerals can tell us if the environment was cool or warm, wet or dry, or whether the water was fresh or salty. Because CRISM is able to detect many minerals that form in soil, a goal was to use the instrument to help decipher ancient Martian environments. Discovery - a global layer cake of clays: In many areas scattered through Mars' highlands, CRISM has found a characteristic layer-cake pattern of aluminum-rich clays overlying iron- and magnesium-rich clays. Surrounding Mawrth Vallis, these "layered clays" cover hundreds of thousands of square kilometers. Similar layering occurs near the Isidis basin, in the Noachian plains surrounding Valles Marineris, and in Noachian plains surrounding the Tharsis plateau. The global distribution of layered clays suggests a global process. Layered clays are late Noachian in age, dating from the same time as water-carved valley networks. The layer-cake composition is similar to what is expected for soil formation - a weathered upper layer leached of soluble iron and magnesium, leaving an insoluble aluminum-rich residue, with a lower layer that still retains its iron and magnesium. Some researchers have suggested that the Noachian clay "layer cake" was created by soil-forming processes, including rainfall, at the time that valley networks formed. These two false-color versions of a single CRISM image (left and center) and a HiRISE color image (right) show the layer-cake composition of clay-rich rocks around Mawrth Vallis. The left image shows minerals whose signatures appear at infrared wavelengths: the gray area is basaltic cap rock, and the green and magenta are aluminum-rich and iron/magnesium-rich clays forming an upper and lower layer, respectively, that are visible through an erosional window in the cap rock. The center image shows minerals whose signatures appear at visible wavelengths: the green and rust colors show oxidized iron ("ferric") minerals present in both clay layers. The HiRISE color image (right, from the location marked by the white rectangle) shows the clay layers below a remnant of cap rock. Discovery - global mineral powder: Over most of Mars' history, liquid water has been either absent or incredibly rare. The MER rovers carry instruments called Mossbauer spectrometers, which can distinguish between minerals that contain iron. The MERs found that in windblown sand and dust, pervasive everywhere on the planet, about half the iron occurs as finely powdered basaltic minerals, including olivine that would have quickly weathered had it been exposed to persistent water. The other half of the iron has been oxidized. Wherever CRISM has imaged Mars' pervasive dust, at visible wavelengths it is red due to the oxidized iron minerals, but at wavelengths about 0.8-1.7 micrometers it still has a broad, very shallow absorption suggesting finely powdered olivine. This result is consistent with results from the MER rovers' Mossbauer spectrometers. "Soil" formed later in Mars' history appears to be mostly finely powdered rock with little chemical alteration, telling of eons with limited exposure to water. 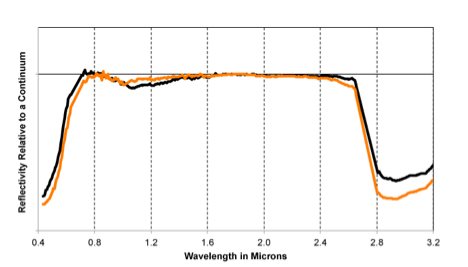 This chart shows CRISM spectra of sunlight reflected from two Martian soils. The black spectrum is from the Mars Exploration Rover Spirit landing site; the orange spectrum is wind-blown dust that has settled out on the peak of Olympus Mons. Both spectra have a fall-off in brightness at visible wavelengths (0.4-0.7 microns) due to ferric iron minerals; a dip at 0.8-1.7 microns due to finely powdered basalt; and a pronounced minimum near 3 microns due to water bound to minerals in the soil. The dust spectrum is steeper at visible wavelengths with a shallower 1-micron absorption and deeper 3-micron absorption possibly due to a larger fraction of hydrated, oxidized components. Question 1.2: Did Martian sedimentary rocks form in lakes or oceans, and might they preserve evidence for ancient life? Lake and marine environments are favorable for fossil preservation, especially where the sediments they left behind are rich in carbonates or clays. Hundreds of highland craters have horizontally layered, sedimentary rocks that may have formed in lakes. CRISM has taken many targeted observations of these rocks to measure their mineralogy and how the minerals vary between layers. Variation between layers helps us to understand the sequence of events that formed the sedimentary rocks. Discovery - clays in deltas: The Mars Orbiter Camera found that where valley networks empty into craters, commonly the craters contain fan-shaped deposits. However it was not completely clear if the fans formed by sediment deposition on dry crater floors (alluvial fans) or in crater lakes (deltas). CRISM discovered that in the fans' lowermost layers, there are concentrated deposits of clay. More clay occurs beyond the end of the fans on the crater floors, and in some cases there is also opal. On Earth, the lowermost layers of deltas are called bottom set beds, and they are made of clays that settled out of inflowing river water in quiet, deep parts of the lakes. This discovery supports the idea that many fans formed in crater lakes where, potentially, evidence for habitable environments could be preserved. This false color CRISM image shows fan deposits (left side of the image) in Eberswalde crater, one of the locations that had been considered as a target for the Curiosity rover. Red colors indicate clay minerals exposed in the bottom layers of the fans. Blue colors indicate opal. This image is about 10 kilometers across. 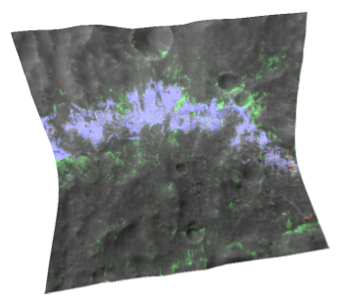 Discovery - salt and clay deposits in ancient depressions: Before CRISM began its exploration of Mars, the THEMIS thermal infrared imaging system on Mars Odyssey found hundreds of rock formations with a peculiar, bluish "color" at thermal infrared wavelengths. Not many minerals have that characteristic, and the most common class of minerals that does is chloride salts, such as halite (common table salt). The thermal-infrared bluish rock formations occur in depressions into which valley networks empty, consistent with dry lakebeds. CRISM discovered that many of these salt deposits occur together with eroded accumulations of clay, typically overlying the clay. If the clay formed in the same lakes, it may record earlier, less saline phases of those lakes' histories that could have been more habitable by early Martian life. 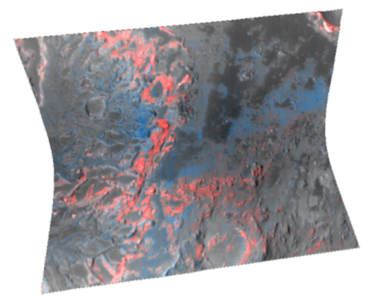 This false color CRISM image shows part of a flat-bottomed lowland in the highland region Terra Sirenum. The grayish areas are basaltic rock and soil that form the floor of the lowland. The bright green rock formations are eroded hills of clay-rich rock sitting atop of the basalt. The chloride deposits have a pinkish color at CRISM's near-infrared wavelengths. They fill low areas between the eroded clay hills, suggesting that the chloride is younger. This image is about 10 kilometers across. Discovery - spring-fed lake deposits: Not all ancient Martian lakes were fed by inflowing valley networks. CRISM discovered several craters on the western slope of Tharsis that contain "bathtub rings" of sulfate minerals and a kind of phyllosilicate called kaolinite. Both minerals can form together by precipitating out of acidic, saline water. These craters lack inflowing valley networks, showing that they were not fed by rivers - instead, they must have been fed by inflowing groundwater. (Many lakes on Earth are also fed by groundwater; this is not uncommon.) The chemical precipitates in these ancient lakebeds would be excellent locations in which to search for fossilized evidence of past life. 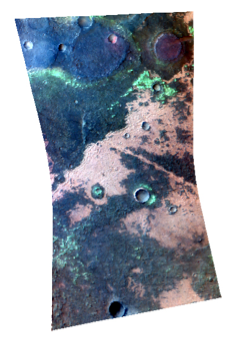 This false color CRISM image of the northern inside wall of Columbus crater shows part of a "bathtub ring" shaped deposit of sulfate minerals (blue) and kaolinite (green). These minerals could have precipitated from acidic lakewater. The image is about 10 kilometers across. Discovery - history of layered deposits in Valles Marineris: Eroded plateaus of horizontally layered rocks ("ILDs", or interior layered deposits) occur on the floor of Valles Marineris. There have been several suggestions about how ILDs might have formed: as lava flows, volcanic ash, dust falling out of the atmosphere, spring deposits, or lake deposits. The emergence of outflow channels from eastern Valles Marineris, plus the streamlined shapes of the ILDs, has suggested to many scientists that water had to be involved. The OMEGA spectrometer on Mars Express discovered that ILDs are rich in sulfate minerals that form in liquid water, confirming a role for water but leaving its exact nature unclear. CRISM discovered that the mineralogy of sulfates varies from layer to layer, between minerals that form under conditions of different water salinity. Some layers have minerals that suggest less saline water, whereas other layers suggest more saline water. Many scientists analyzing CRISM images think that the best explanation is that ILDs formed in shallow lakes from a mix of infalling dust and different sulfates, as water chemistry changed while the climate became wetter or drier. 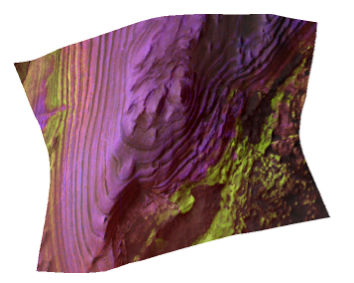 This false color CRISM image, about 10 kilometers across, shows interior layered deposits in Juventae Chasma. Magenta colors indicate layers rich in sulfate minerals that have multiple molecules of water bound to each mineral molecule, which formed in relatively wet conditions. Yellow-green colors indicate layers rich in sulfate minerals with only one molecule of water per mineral molecule, which probably formed in very dry conditions. Question 1.3: Did Mars have hot springs, and if so where are their deposits preserved? The identification of hot spring deposits was a priority for CRISM, because hot springs would have had energy (geothermal heat) and water, two basic requirements for life. One of the signatures of hot springs on Earth is deposits of silica, like the silicate that occurs at hot springs in Yellowstone National Park in the U.S. The Mars Exploration Rover Spirit explored a silica-rich deposit called "Home Plate" that is thought to have formed in a hot spring. Discovery - hot spring deposits: CRISM has discovered silica-rich deposits in many locations. Some are associated with central peaks of impact craters, which are sites of heating driven by meteor impact. Silica has also been identified on the flanks of volcanic inside the caldera of the Syrtis Major shield volcano, forming light-colored mounds that look like scaled-up versions of Home Plate. Elsewhere, in the westernmost parts of Valles Marineris, near the core of the Tharsis volcanic province, there are sulfate and clay deposits suggestive of "warm" springs. Hot spring deposits are one of the most promising areas on Mars to search for evidence for past life. This false-color CRISM image (left) shows mounds of hydrated silica on the flank of a volcanic cone in the caldera of the Syrtis Major shield volcano. 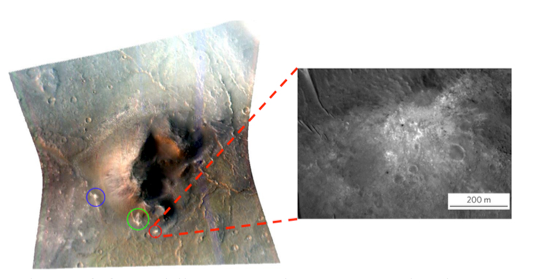 Each mound is circled in a different color; one of the mounds (circled in red) is captured in the HiRISE image at right. The mounds may have formed from hot springs that discharged onto Mars' surface and built up precipitated minerals. A hydrothermal mound like this would be a prime location in which to search for evidence of past life. The CRISM image is about 10 kilometers across. Question 1.4: Is an ancient Martian atmosphere trapped in carbonate rocks? Discovery - carbonates exist but are rare: One of the goals that drove CRISM's design was to do the best possible job of spotting carbonates. And in one of its most important discoveries, CRISM DID find carbonate bedrock! It is rare, forming scattered outcrops usually of thin layers, which is one reason why no previous instrument found carbonate bedrock. One study by CRISM scientists estimated that all of the carbonate rock holds less that the present Martian atmosphere worth of carbon dioxide. If a dense ancient atmosphere did exist, it is probably not trapped in the crust. This false color CRISM image at left and the HiRISE image at right (at the white rectangle) show a thin carbonate layer that occurs northwest of Isidis basin. The carbonate appears pea green in the CRISM image. It is sandwiched between a layer of phyllosilicate minerals that predates Isidis and younger, erosion-resistant basaltic cap rock.